Satori Two – Monitor is a large sized 2-way stand-mount loudspeaker for small to medium sized listening rooms. 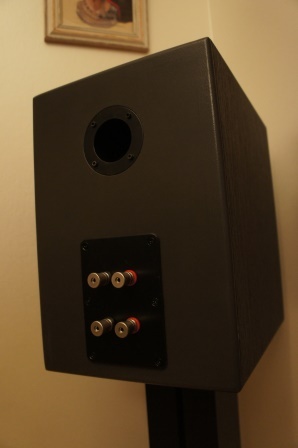 The loudspeaker uses custom built enclosures with a stepped baffle configuration in order to time align the driver units. Note! The tweeter grill can be removed if you don’t like the look of it. Removing the grill doesn’t affect the frequency response or the loudspeaker performance in any way. 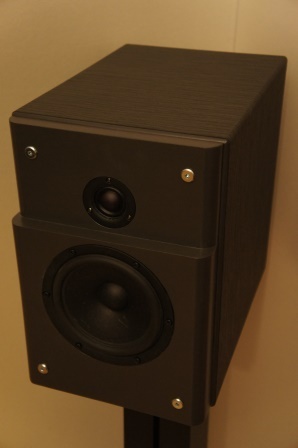 Satori Two – Monitor uses a 4Ω mid-woofer from the SB Acoustics Satori series. 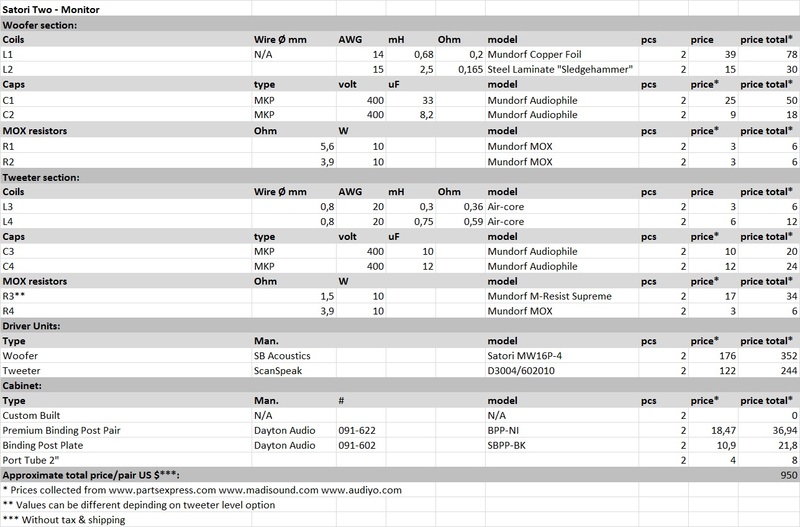 The Satori MW16P-4 driver is one of the very best mid-woofers in its size, available to the DIY market today. It has a nice bass performance and a very nice mid-range reproduction, combined with very low distortion. The tweeter section consists of a compact sized 4Ω driver from ScanSpeak Illuminator Series. The D3004/602010 tweeter has a small face plate which allows a close center to center spacing between the mid-woofer and tweeter. It has great off-axis dispersion combined with low distortion. The Satori Two – Monitor uses a custom built 20 liter enclosure. The enclosure is made of 19mm MDF and uses internal braces in order to make the enclosure more rigid. The baffle is made of two 19mm MDF pieces in order get a “stepped” baffle design and has an 18mm baffle edge round-over in order to reduce baffle diffraction. 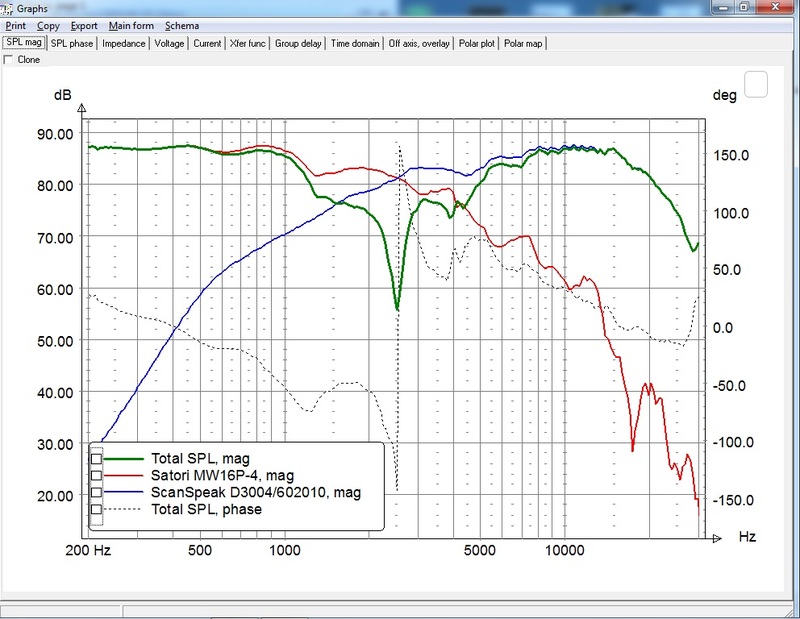 This is the anechoic response when using the custom built 20 liter enclosure. When the volume for the drivers, port and bracing are subtracted we have an effective net volume of about 19 liters. 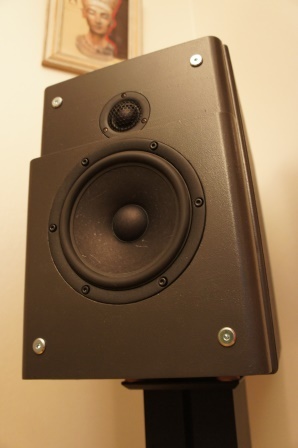 The closed box version is not tested, but could be an option if the loudspeaker is placed very close to the rear wall or actively crossed-over and used together with a sub-woofer. The Satori Two – Monitor uses a true symmetrical second-order Linkwitz-Riley (LR2) filter topology. 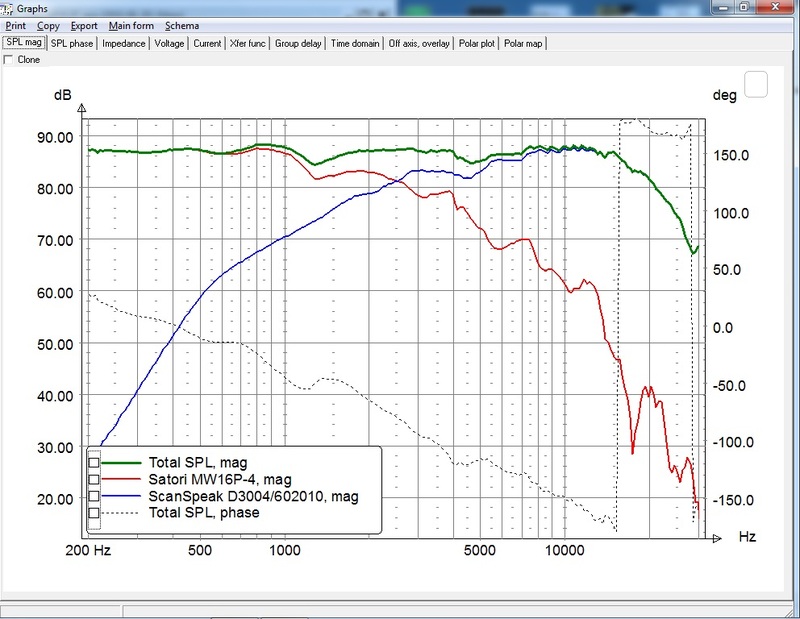 When using a shallow sloped cross-over like the LR2 filter topology, one of the most important design factors for a successful implementation is to time align the loudspeaker drivers. 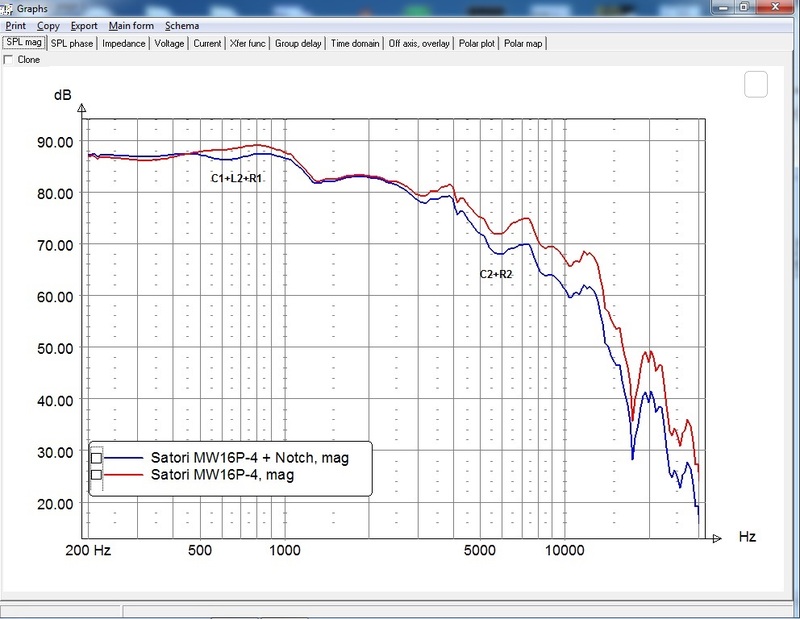 In this case the mid-woofer and the tweeter need to have their “relative acoustic center off-set” adjusted. The most common way to address the driver units relative acoustic center off-set is to use asymmetrical cross-over slopes, a sloped baffle or to use an electronic time delay circuit. In this design I use a different approach to time delay the tweeter to adjust the acoustical center off-set. 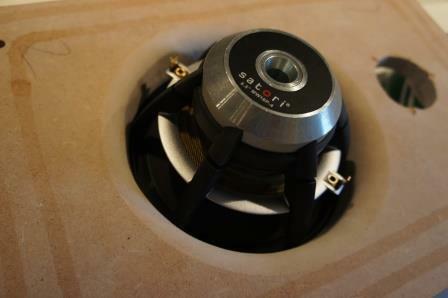 It’s done by using a “Stepped Baffle” and where the mid-woofer is mounted 19mm in front of the tweeter. The mid-woofer cross-over filter section is very simple and consists of a coil (L1) and a response shaping filter circuit (C1+L2+R1) and impedance equalization circuit (C2+R2) which shapes the cross-over slopes to a LR2 (acoustical) roll-off with a targeted 2.5kHz cross-over point. The inductor (L1) and the response shaping filter circuit (C1+L2+R1), tunes the design with a full “Baffle Step Compensation” (BSC). If using a different coil (L2) than shown in the schematics, the sum of the resistance for the coil (L2) and the resistor (R2) should be about 5,75 Ohm. 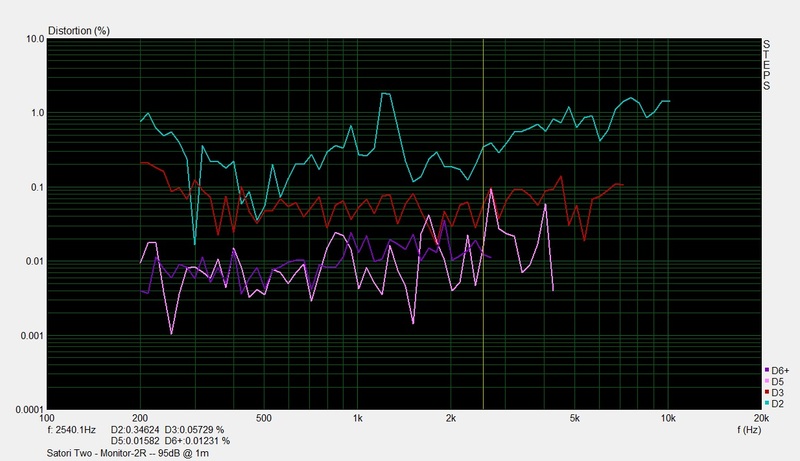 The effect of the response shaping circuit (C1+L2+R1) and the impedance equalization circuit (C2+R2) can be seen in this picture. Without the response shaping circuit (C1+L2+R1) the loudspeaker have too much energy in the mid-range and is too much forward sounding to sound natural. The tweeter cross-over filter section consists of a single tweeter padding resistor (R3) and a second-order electrical filter (C3+L3) and a response shaping circuit (C4+L4+R4) that shapes the cross-over slope to a LR2 (acoustical) roll-off with a targeted 2.5kHz cross-over point. Note! The tweeter is connected with reverse polarity. 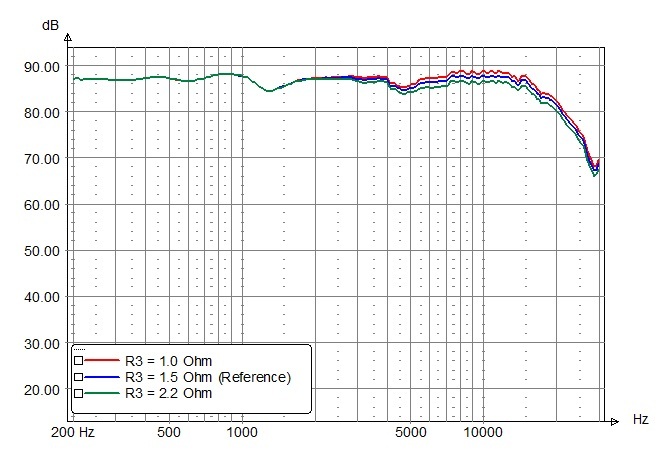 As shown in this picture, (C4+L4+R4) flattens out the tweeters frequency response peak around 2kHz, partly caused by the added baffle diffraction of the “stepped baffle” design. 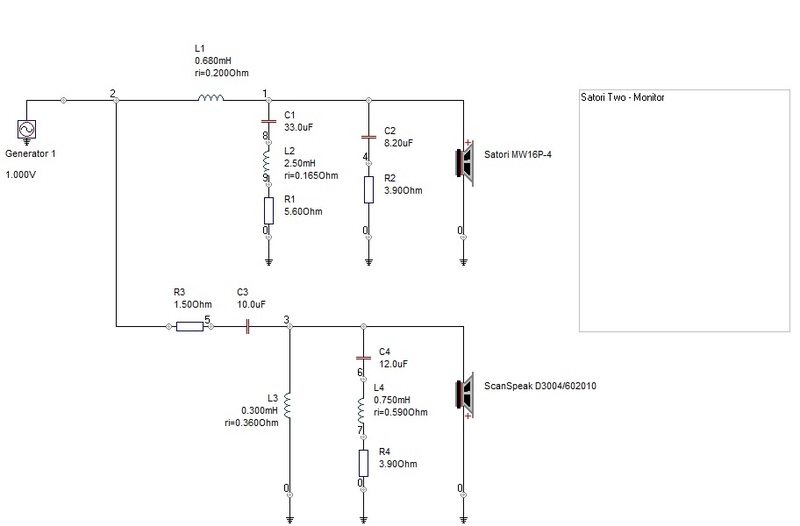 This response shaping circuit is necessary to shape the filter to a LR2 filter slope. If using a different coil (L4) than shown in the schematics, the sum of the resistance for the coil (L4) and the resistor (R4) should be about 4.5 Ohm. The value of (R3) can be changed to adjust the tweeter level to personal preferences. Any resistor padding value between 1.0-2.2 is acceptable, but 1.5 Ohm is what I ended up with as the reference level. The reverse polarity simulation shows a very deep reverse null at the cross-over frequency, indicating a good phase tracking between the two driver units at the cross-over point. 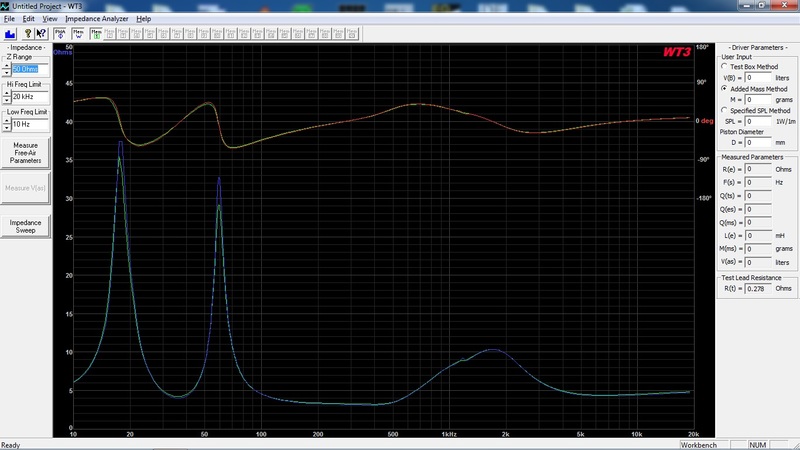 3.2 Ohm impedance minimum @ 400Hz. For best performance, a 4 Ohm rated and capable amplifier should be used with this loudspeaker. Overall a very smooth frequency response. 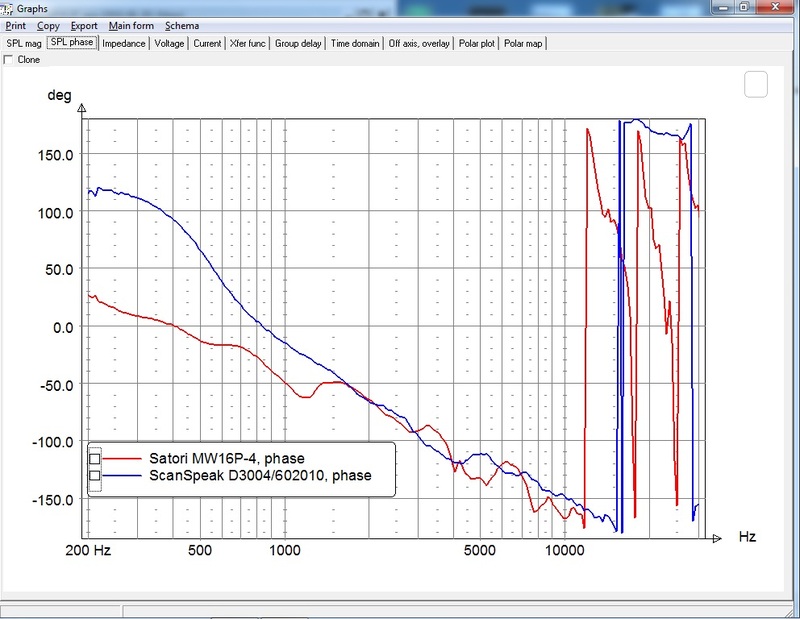 The tweeter response gradually drops from about 15kHz and is down about -3dB @ 20kHz. 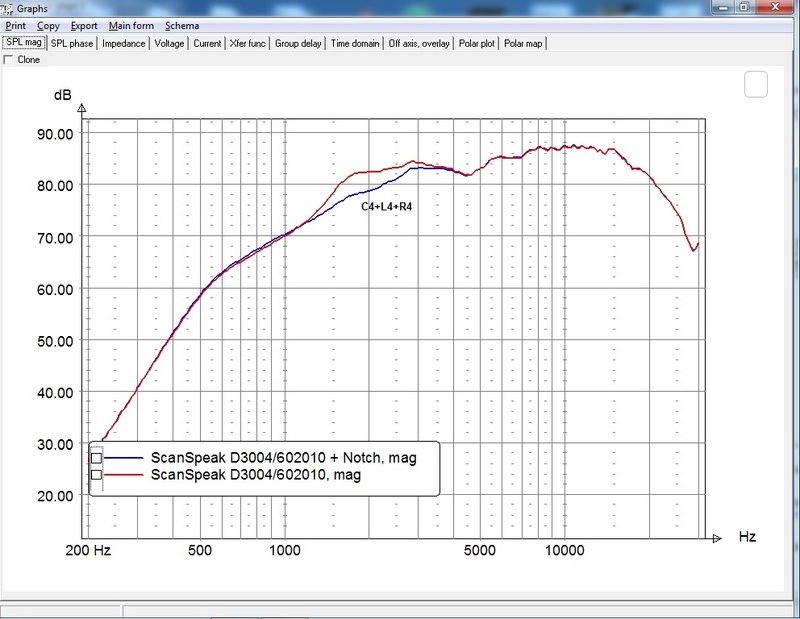 Between 15-30deg off-axis we have a dip in the frequency response around 5kHz due to the baffle diffraction effect. This smooths out as we go beyond 30deg off-axis. Top: Tweeter-axis, 15deg off-axis response blue = With felt, Red = Without felt. Left: Without felt 0, 5 and 10deg vertical off-axis response above tweeter-axis. Right: With felt 0, 5 and 10deg vertical off-axis response above tweeter-axis. As we can see by the frequency response curves, we can smooth out the diffraction issue around 5kHz by adding some felt below the tweeter at an 45deg angle (see picture). This smooths out the frequency response considerable between 3-15kHz, but introduces another diffraction issue right in the middle of the cross-over region at 2.5kHz. Remember that dips are less audible than peaks in the frequency response. The felt tweak is more of a cosmetically frequency response curve nature, than anything else. I personally think that the loudspeaker sounds better without the added felt than with it, because the felt introduced diffraction is worse than the dip around 5kHz caused by not using felt. However, the felt tweak is an easy cheap way to test and I do recommend testing it. The listening sweet spot is a bit more limited in the vertical plane when taking the diffraction into account and I recommend sitting down and listen to the loudspeaker at tweeter height rather than standing up, which of course would be the normal thing to do anyway. The distortion measurements are done in near-field and the amplifier output level was adjusted for each driver so that the fundamental is 90dB and 95dB at 1m. This setting simulates medium and high listening levels. The Satori Two – Monitor is overall a very low distorting loudspeaker with a remarkable low odd order harmonics. The third order harmonics is well below 0.2%, even at higher listening levels, but the more harmless second order harmonics is somewhat elevated compared to the odd-order. The suggested components would cost about 950 US$ excluding the custom built enclosures, but the cost can be reduced by choosing less expensive cross-over components. I strongly recommend that all the components connected in series with the drivers (L1 + R3 + C3) at least have the component quality as suggested here. All other cross-over components can be of simpler quality to reduce cost as long as they follow the specification. The Satori mid-woofer is a very nice sounding driver and it delivers an amazing presence, clarity and transparency in the mid-range. The bass is deep, well defined and never too exaggerated. The ScanSpeak tweeter blends nicely with the mid-woofers characteristics. Even though the tweeter gradually starts to roll-off at 15kHz, nothing seems to be missing in its natural sparkle. The loudspeaker has good imaging and a large soundstage with a good sense of depth. The crossing between the mid-woofer and tweeter is seamless and together they deliver a remarkable presence, especially on vocals. At the same time they have a pure, yet a soft, effortless, refined and open sound without any hint of cold analytic sound. 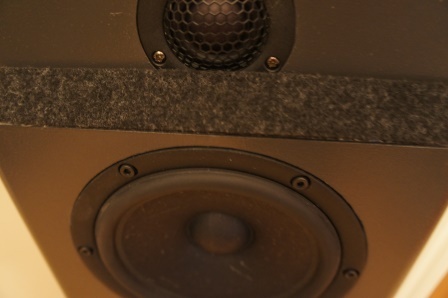 Due to the diffraction introduced by the “stepped baffle” configuration the vertical listening sweet spot is somewhat limited, but the soundstage doesn’t collapse when standing up. It’s still recommended to listen to the Satori Two – Monitor with the tweeter at ear height. Toed-in 0-15deg towards the listener. 2.5-3 meters listening distance with tweeter at ear height.